Clare Toohey has been making fabulous mosaic crafts, so she's here to tell us how to make this raven ornament. 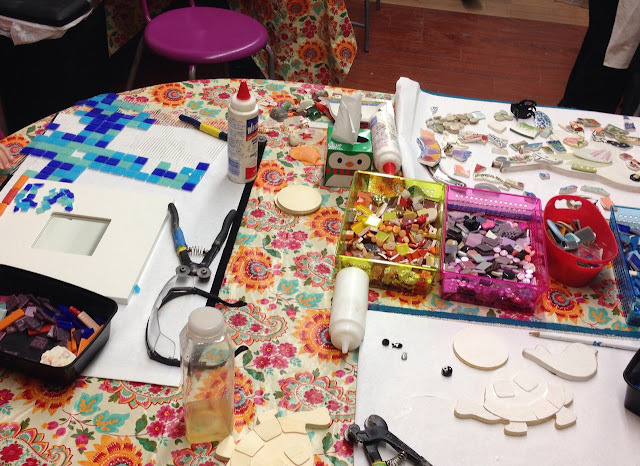 Recently, I was at a mosaic workshop at Wishflower Studio here in New York [http://wishflowerstudio.com]. 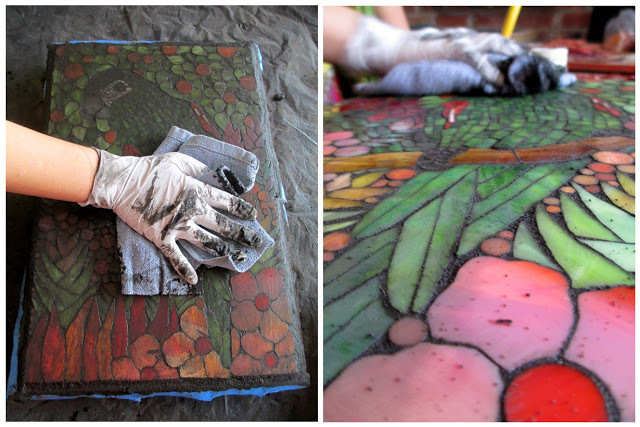 It’s over weekend so you can design and glue your project on Saturday, then let it dry overnight, and grout it on Sunday. Our teacher, Libby Denenberg, has a wonderland of a workshop, shelves to the ceiling full of jars and bins, with many more drawers and cabinets of mixed media that can all be used, including beautiful colored glass (of course), but also tiles, beads, ceramic dishes, buttons, toys, shells, stones…. Half the fun is poking around and “shopping” to see what catches the imagination. In addition to the materials, we had lots of options for different projects to work on, too, like frames and plaques and sun-catching windows. I decided to work on a bird, but not just any one, a properly criminal one. Around the bird are some small glass pieces I was considering using, a blob of the white glue I used later to affix them, and the tool below is a glass cutter, used to nip pieces from larger glass sheets or tiles for use, or to nibble them into better shapes. I used it principally to split a square diagonally for the glass beak and to make a ridge of small rectangles along the spine. We were wearing glasses/safety glasses, because even shadowing the pieces being cut with your other hand and cutting into a plastic bin, the wily little bits are springy. I enjoyed working on small projects with little pieces that needed tweezers (in a previous life, I obviously built ships in bottles). Once they're arranged in a way that pleases, it’s time to glue them in place. In general, we left an eight to a sixteenth of an inch between the pieces for grout later, but that’s variable based upon how you want it to look, and we were all about the fun, not about calipers! You can see the blobs of glue, and as long as they weren’t too huge, we didn’t worry. Grouting covers many sins, bwahaha. The next day, when the projects were dry, we came back to grout. During grouting, I was wearing gloves and had my hands full of yuck and forgot to take pictures- a shame, because it’s really where the projects come alive. So, here are two similar pictures I cadged from mosaic artists online—please link to their blog posts for more descriptions and images! First, here's Margaret Almon demonstrating the bravery required to cover over all your fine work with a sandy slurry in the confidence it will come back even better. Grout can be mixed in almost any color, both natural and tinted shades, also with add-ins like glitter. After I’d decided the shade—the birdie required black, of course!—the grout was mixed to the consistency of wet cake batter. 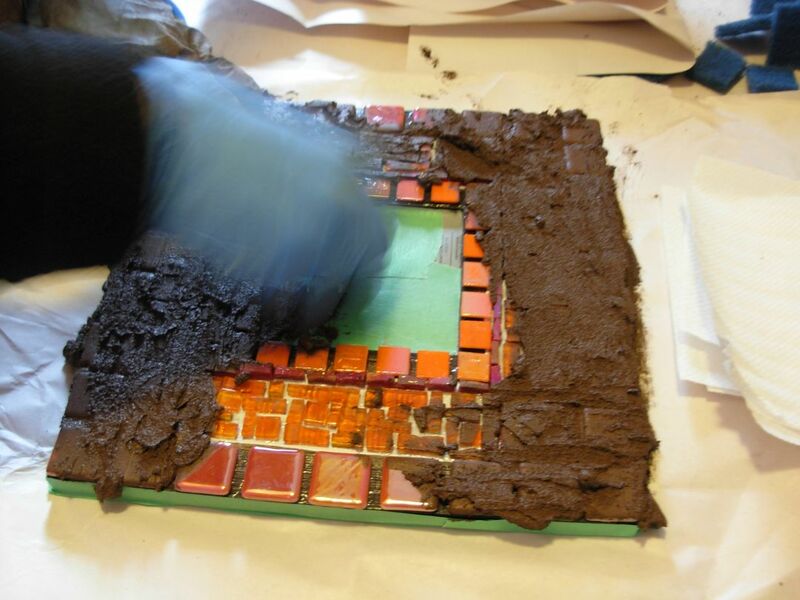 We dumped the frosting onto our projects using plastic spoons and knives or just our fingers, ladling grout onto the surface so a thick coating could be layered across and smushed into all the gaps. The grout takes a bit of time to set up and dry completely, so you have plenty of time to work with it, but right away, you can begin wiping off the excess. And wiping and wiping and wiping…. Here’s artist Kasia Polkowska demonstrating how that gradually reveals the final project. We wiped ours with paper towels and even damp sponges and toothbrushes, depending upon how far below the upper surface we wanted the grout to stay. This is a chance to even out what’s uneven or create more topography. As the muddy grout dries, it can leave a slight pale haze on the topmost surfaces, so once the project was done drying (the next day), I gave the surface a final wipe with white vinegar just to remove any remaining grit from the beads and glass and give it a nice shine. A black hanging ribbon and an insouciant plume were all this little raven needed to be ready to caw. If you look closely, you’ll see his very black heart, but that’s no reason not to like someone (I dearly hope!). I love this craft Clare. Thank you so much for making the Raven ornament. It was super fun! Mosaic is an awesome format for playing around--thanks for giving me a place to share it! This turned out fabulous Clare. Makes me want to craft! Wish we all lived closer together.